Use the instructions included in the TurboTax FAQ below to add PLUS and make payment. This process will unlock your prior years' returns. 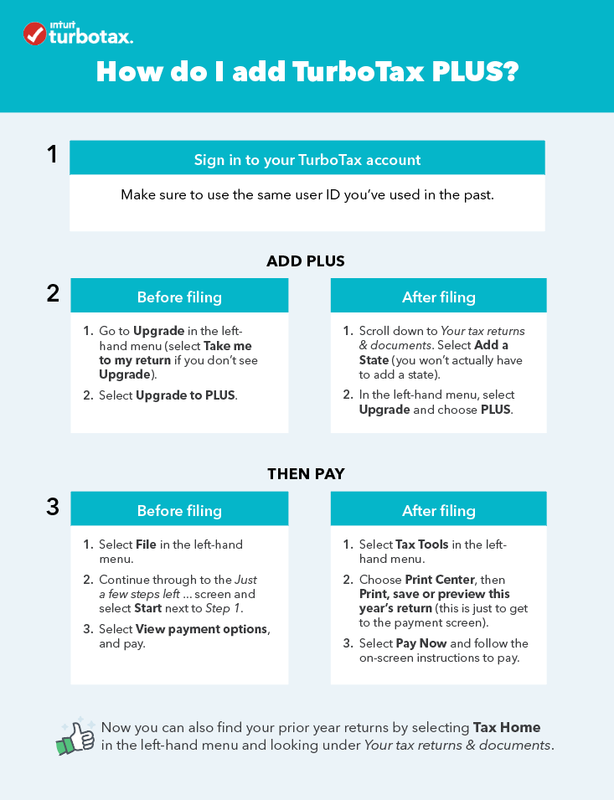 To access your last seven years of tax returns you filed with TurboTax, you'll need to purchase PLUS Help & Tools. Already filed your return? Go here instead. Select Upgrade in the left-hand menu. (If you can't see it, select the menu icon in the upper-left corner, and/or select Take me to my return if you're not in your return yet.). In the new window, select PLUS, then select Upgrade Now (if PLUS is grayed-out, skip this step). Now you're ready to pay. On the left side, select File. Keep going until you reach the Just a few steps left... screen. On this screen, select Start next to Step 1: Review your order and follow the screens to pay with your credit card (don't pay with your refund if you see that option). After you've paid, select Tax Home on the left side. This will take you to You're doing great. Keep going! Select Show next to Your tax returns & documents to expand the prior-year list and then select Download/print return (PDF) for the tax year you want.